On my way to the gym this morning I was thinking about what picture I was going to post (I keep a few ideas in my head for the next day's photo in case something photo and blog worthy doesn't happen I have a stand by) and in front of me walks probably 30 - 35 wild turkeys... Okay they win, they might be ugly but it isn't all that common that they saunter down main street... 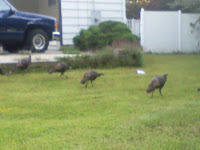 This is the best of the pictures I took - I hope they are finding a hiding place before Thanksgiving! Way to think ahead Mr. Turkey man! Can I also add I have NEVER been SO HAPPY to be in a car - those suckers are HUGE and scary looking!